Alkaline batteries: These traditional batteries usually have a pretty short life in a digital camera. Lithium batteries: Tend to last longer than other battery types. They also handle cold weather better. Rechargeable batteries: Choose nickel metal-hydride (NiMH) rechargeable batteries if you can because they have more power, are safer for the environment, and have several technical advantages over other types. You can also use lithium-ion (Li-Ion) rechargeable batteries, which usually last for a couple hundred shots. This figure shows both types of rechargeable batteries. Of course, rechargeable batteries need a battery charger. You can use a battery charger that plugs into a standard wall socket or one that’s solar-powered. 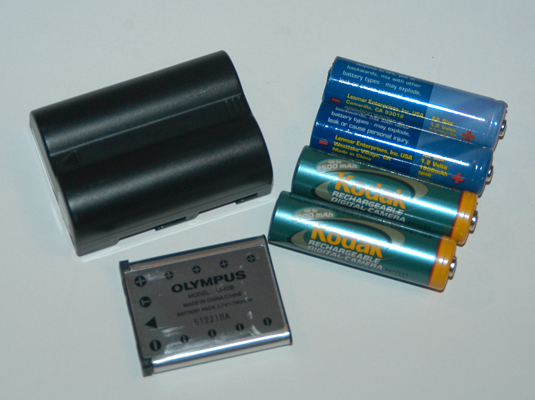 Power your digital camera with a NiMH rechargeable battery (left) or a Li-Ion one (right). Battery pack: Some cameras can be fitted with an add-on battery pack (as shown in this figure) that fits under the camera body and holds two more batteries (increasing the length of your batteries’ life).